There’s a pattern running through Ruth Morris’s life-long love affair with textiles that suggests her latest venture, like the clothes she creates, will run and run. A rich seam of resourcefulness – that reaches back to childhood – is enabling the Perthshire-based designer and maker to subtly reshape the business she began nearly 20 years ago. Ruth, whose distinctive Roobedo collection ships worldwide, is resetting her priorities to spend more time sharing her passion for sustainable, hand-crafted items with others. Growing numbers are learning about Ruth’s versatile approach, which has created a distinctive brand of clothing, accessories and homeware based on quality, craft and a quiet commitment to ethical fashion: not so much ‘waste not, want not’ as ‘waste not, flaunt it’. It’s an approach Ruth first developed on a hand-me-down sewing machine inherited from a great aunt as a young girl. Themes of reuse, recycling and reducing waste have been a constant motif ever since. 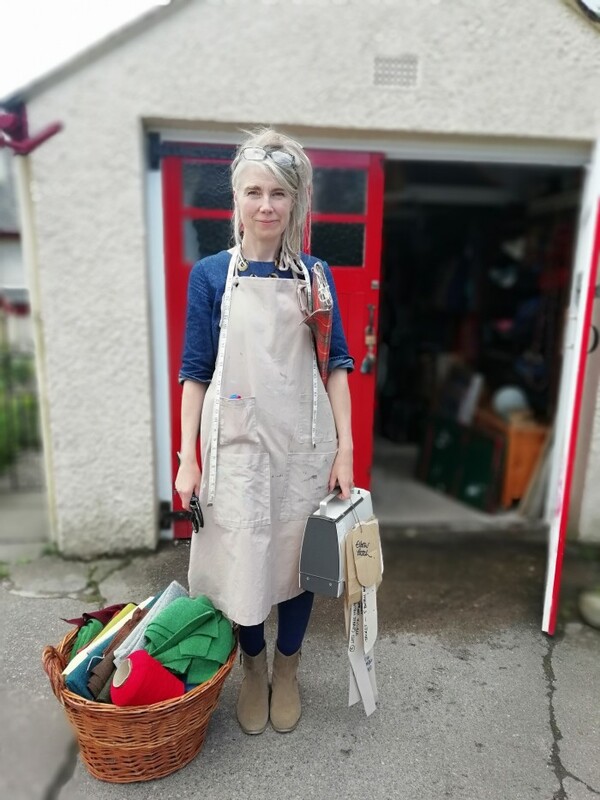 “Upcycling is a theme that’s always been simmering away on the back-burner for me,” says Ruth, who trained at the Scottish College of Textiles in Galashiels and is now based in the hamlet of Moulin near Pitlochry. Ruth’s enthusiasm for the slow fashion movement, with its commitment to smaller carbon footprints, is long held, and you sense that this might be her moment. A new series of evening classes in Pitlochry, with its theme of ‘reusable packaging and everyday things’, has been oversubscribed. Now Ruth is hoping to run elements of the classes again with Zero Waste Perth and Birnam Climate Café. Such enthusiasm has not gone unnoticed at national level. The Scottish Government is to invest more than £700,000 to help businesses in the so-called circular economy, which aims to reduce waste and invest in keeping materials in circulation for as long as possible. 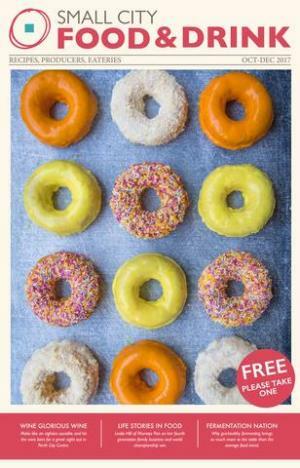 And figures released this month by the Scottish Government-funded Zero Waste Scotland organisation suggest circular business practises in the Tayside region, which includes Perth and Dundee, could mean a £400-million boost to the local economy. “This has been an exciting development for me, and a path I am keen to explore,” says Ruth. “I’ve had such a great response with interesting discussions each evening on how we can be more conscious about what we are using, and try to make a small difference in our daily habits to reduce waste, especially of single-use plastic." 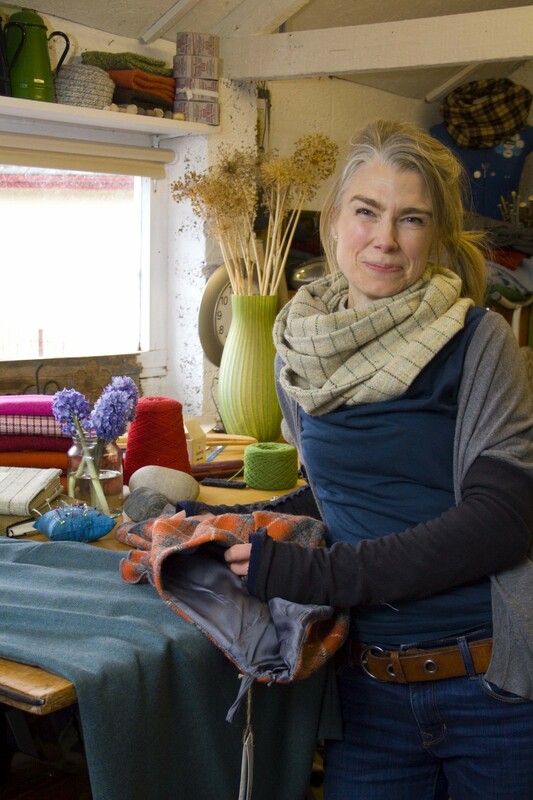 A part-time lecturer in textiles at Dundee and Angus College, Ruth is constantly sharing her skills by running workshops and repair cafes with Pitlochry and District Adult Education Association, Birnam Climate Cafe and Zero Waste Scotland. A craft night in Birnam, making zip purses from recycled materials, led to workshops with Dunkeld Youth Group that produced rice-filled hand warmers and messenger bags made from jute sacks sourced from Glen Lyon coffee roasters. Amazing duvet dresses were a highlight of a fashion show at Birnam Institute. This summer, as part of Pitlochry Artwalk, Ruth showcased a new collection in Cafe Calluna made from completely recycled materials – T-shirts from charity shops, hand-screen printed with her own hand-drawn designs – which sold out. Ruth also made messenger bags and stash cases from old banners and car seat belts which again sold extremely well. Using recycled materials meant she could keep prices down, reuse resources and provide a selection of desirable products that were eco-friendly. Aiming for zero waste, all textile waste is kept to a minimum by making to order and keeping and re-purposing scraps. “I’m well aware of the sad reality of the side effects of today’s disposable fashion and textiles industry. Presented with so much choice and cheapness, it’s much easier to consume what’s convenient without thinking too much about the impact of our choices." Ruth works with sustainably sourced fabrics as much as possible. She is also starting to switch to recycled cloths and is even looking into composting her scraps, particularly now that she’s using mainly organic cottons and wool. It’s been quite a journey since Ruth first got to grips with her great aunt’s sewing machine, which used a hand crank to stitch seams. Ruth loved the simplicity of joining two pieces of fabric to create something three dimensional. “Firstly I made clothes for my dolls and dogs,” she recalls, “then, at the age of 13, I was given an electric sewing machine by my grandmother, and discovered a monthly magazine which had patterns for clothes. I made lots for myself and started making them for friends. 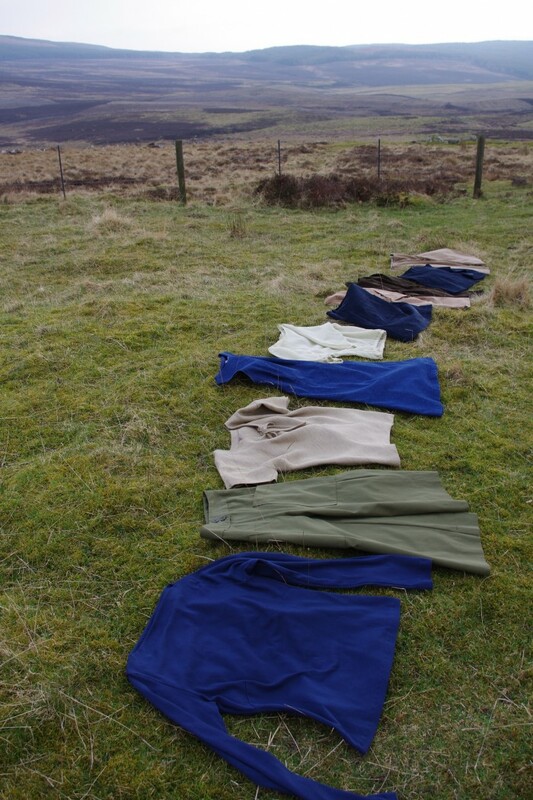 Her work is deeply connected to the landscape of the Scottish highlands and islands, resulting in a fresh and contemporary collection of wearables that has been described as ‘urban dressing with a blast of country air running through it’. Longevity and function are a key art of the Roobedo ethos. Useful pockets, simplicity of fit, and fabrics tested for durability and washability produce clothes that can be worn dressed up or dressed down. Aiming for zero waste, all textile waste is kept to a minimum by making to order and keeping and re-purposing scraps. Fair trade is a passionate focus too. Featuring alongside organic cottons and denim – as well as recycled and vintage cloths – are premium Scottish fabrics, such as Harris tweed and Perthshire’s own Glenlyon tweed, made in Aberfeldy. The Glenlyon tweed first came to Ruth’s attention when she moved to Moulin ten years ago: “It’s woven in the amazing tweed mill in Aberfeldy, which has a wonderful smell of lanolin and machine grease and, downstairs, a floor crowded with clacking looms. 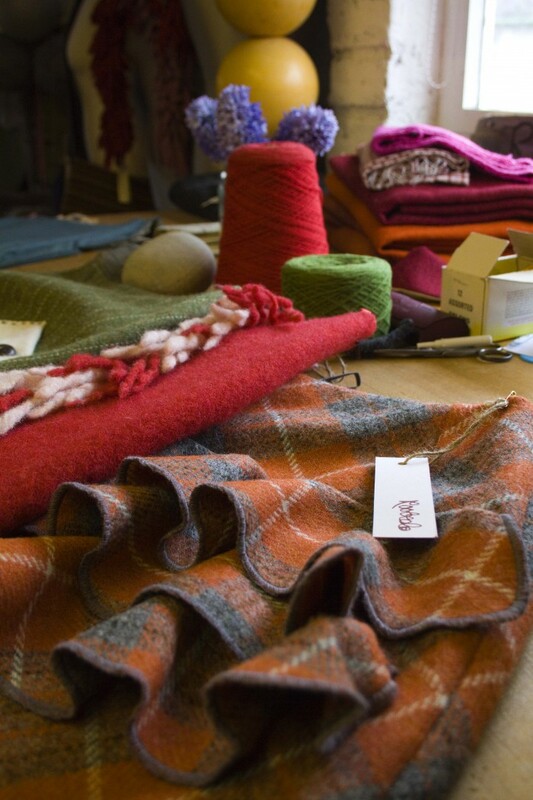 “Upstairs is a showroom full of bales of tweed, the beautiful colours in each pattern inspired by the Perthshire hills. Feeling lighter in weight than Harris Tweed, it has a beautiful drape and a soft handle. The black jute was sourced through McGregor Balfour (Textiles) in Dundee and, with her close ties to the city, Ruth says it feels right to be using the cloth. “I grew up beside a jute mill, and I have vivid memories of hearing the looms when I was out playing in the street. Then I’d hear the lunchtime bell and they’d all be switched off, and it would be so quiet. Ruth designs, cuts and sews every creation herself. Pockets are hand crafted, seams stitched with care and pressed again and again. Hems and special details, such as locally made buttons and horn toggles, are all finished by hand. Ruth graduated in 1993 and, after seven years’ service in the clothing industry as a pattern cutter, garment technologist, buyer and retail manager for a number of independent Scottish companies, she set-up her own business. “I negotiated a half day Thursday, whilst managing a clothing store in Edinburgh and started sewing from home, making my own collection to sell in the shop I worked in. Ruth makes to order from her own collection of styles. Boldness of colour, A-line shapes and crisp wide trousers sit alongside neat tops and tube necklines. 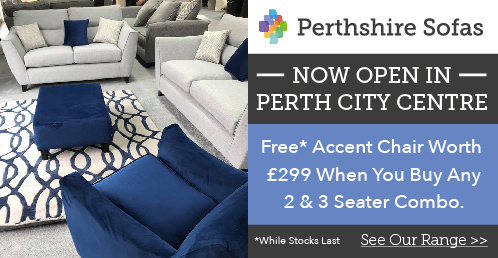 Function is key with useful pockets and comfort paramount, particularly for Ruth, who takes her inspiration from her surroundings: “I didn’t know the area that well before I moved here and, despite missing the sea, it’s been a special discovery of trees, mountains and streams. “I love it and getting our dog Becky has been the best way to get out and really appreciate the surroundings. Having children here has enabled me to really slow down and embrace the changing seasons, each bringing its own beauty. The internet and social media have helped to make the business viable: the company was set up when people spent far less time online but Ruth was fortunate to have friends who were website designers. Their support helped her realise her dream of being able to make and sell her clothes wherever she chose to live; that and Royal Mail, which Ruth still uses to deliver parcels. So how do craftswomen such as Ruth survive – and thrive – in a competitive market, particularly when tweed is on trend? “It is extremely difficult!” she concedes. “My main worry is returns – a few of these and I’m struggling. But that is the case even for the biggest stores. “Roobedo creations are made-to-last. It goes against the grain, or commercial sense, to make clothes and other items that last, but I find that my customers come back time and time again.